Micron has finally introduced a second consumer SSD with 3D NAND flash. Rather than a high-performance NVMe drive, they've brought back the entry-level BX product line for the Crucial BX300. At Computex 2014, Micron introduced the Crucial MX100, the first SSD to use their 16nm MLC NAND. The MX100 was a hit with great performance and great pricing. It was followed up in 2015 by the Crucial MX200, which wasn't much of an improvement over the MX100. But at the same time, Crucial introduced a second product line with the BX100. Using the same 16nm MLC but a cheaper Silicon Motion controller, the Crucial BX100 continued to offer good performance for most purposes and was also the most power efficient SSD of its time. Later in 2015, the consumer SSD market began to rapidly switch over to TLC NAND: consumers wanted cheaper SSDs, but only Samsung had usable 3D NAND, so planar TLC was the way to increase capacity. Micron introduced the Crucial BX200 in November 2015 as their first SSD to use TLC NAND. The BX200 successfully reduced price per GB, but sacrificed a great deal of performance and power efficiency in the process. The BX200's fate was sealed by drives like the ADATA SP550 that used faster and cheaper SK Hynix TLC to undercut the BX200's pricing while offering somewhat better performance. Finally, in June 2016 Micron's 3D NAND was ready for mass market use, and the consumer SSD market's race to the bottom was put on hold. 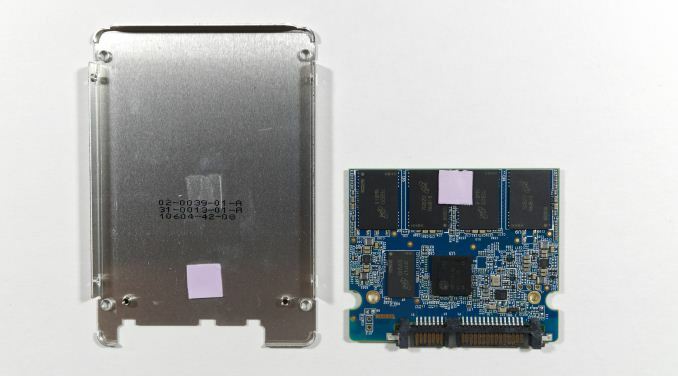 Micron introduced the Crucial MX300 using a high-performance Marvell controller like previous MX series SSDs, but using the TLC variant of their 3D NAND rather than MLC. The MX300 thus was serving as successor to both the MX200 and BX200, and it has done the job well with good performance and far better power efficiency than any previous TLC SSD (even considering Samsung's 3D TLC-based 850 EVO). The main limitation of the Crucial MX300 stems from the odd capacity of Micron's 32-layer 3D TLC parts. The 32L TLC die is Micron's 32L 256Gb MLC operated as a TLC chip, yielding a capacity of 384Gb (48GB) per die. It is awkward to build SSDs with standard power of two capacities out of such chips, so Micron initially introduced the MX300 with a 750GB (768GB raw) capacity model. The rest of the MX300 lineup used capacities that were slightly above the standard sizes (eg. 525GB instead of 512GB), which still left the MX300 with more overprovisioning than a typical consumer SSD. The odd capacity effect is most pronounced with the smallest MX300, the 275GB model. Micron didn't go any smaller than that because a drive in the ballpark of 128GB would use only three TLC dies, wasting one of the four channels on most SATA SSD controllers. Micron's upcoming second generation 3D NAND parts are designed with TLC in mind as the primary use, and Micron will be producing both 256Gb and 512Gb parts. But this new 64-layer 3D NAND is still ramping up in production. Intel has shipped limited quantities in their 545s, but most of the early 64L NAND is going to the enterprise SSD market. That's where the new Crucial BX300 comes in. The BX300 brings MLC NAND back to the Crucial product line for the sake of making smaller capacity entry-level SSDs. The Crucial BX300 will be produced in capacities from 120GB to 480GB using Micron's 256Gb 32L 3D MLC. Micron is again using a Silicon Motion controller for the BX line, this time the SM2258. Micron has not opted to use the DRAMless SM2258XT variant and instead has equipped the BX200 with 256MB to 512MB of their own DDR3. On paper, the BX300 does not appear to be making any significant compromises to reach low price points. In some respects it is superior to the MX300, and it certainly seems like it will have lower profit margins for Micron. The BX300 may be the kind of product that only a vertically-integrated manufacturer like Micron can successfully bring to market in the midst of an industry-wide NAND shortage. ADATA uses the same controller and NAND in their SU900 and SX950 SSDs, but those are selling for significantly higher prices than the Crucial MX300, not lower. The BX300 may turn out to be a short-lived stopgap product to go after a segment of the market that the MX300 is ill-suited for. A replacement for both the MX300 and BX300 using 64L TLC will probably show up as soon as Micron can spare the NAND. Certainly by Computex in June 2018 we should expect a new product, but I wouldn't be surprised to hear about something at CES in January. The Crucial BX300 is Micron's first MLC-based consumer SSD since the Crucial MX200. With the MX200, Micron experimented with using SLC caching on smaller capacities and had mixed success—peak performance was boosted a bit, but at the cost of creating more background work for the controller that hurt sustained workloads. For the Crucial BX300, Micron is using relatively small fixed-size SLC caches. Sequential performance and random write performance are rated the same across all three capacities, while random read performance is reduced a bit for the 240GB and is cut in half for the 120GB model. The rated write endurance numbers are probably chosen simply to be lower than the ostensibly higher-end MX300 model, rather than being based on actually lower expectations for drive lifetime. The MX300 does have lots of overprovisioning with which to reduce write amplification, but the BX300 has a reasonable amount too and the advantage of inherently higher endurance from using MLC instead of TLC. 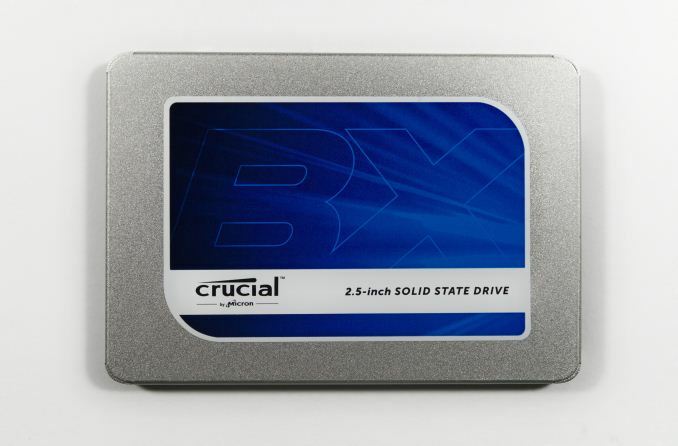 The Crucial BX200 480GB: Micron's first TLC SSD and the nominal predecessor to the BX300. The Crucial MX200 500GB: The last MLC-based consumer SSD from Micron. The ADATA Utimate SU800 512GB: Using the same SM2258 controller as the BX300 but Micron's 3D TLC like the MX300. Can you list them? All other drives are notably slower while costing as much as the 850 Evo, others are even more expensive.